Christmas is just around the corner and we all know how hard it is to find the right gift for our love ones. Starting this month of November 2018, we will be posting gift suggestions per brand that will hopefully ease your dilemmas on gift-hunting. 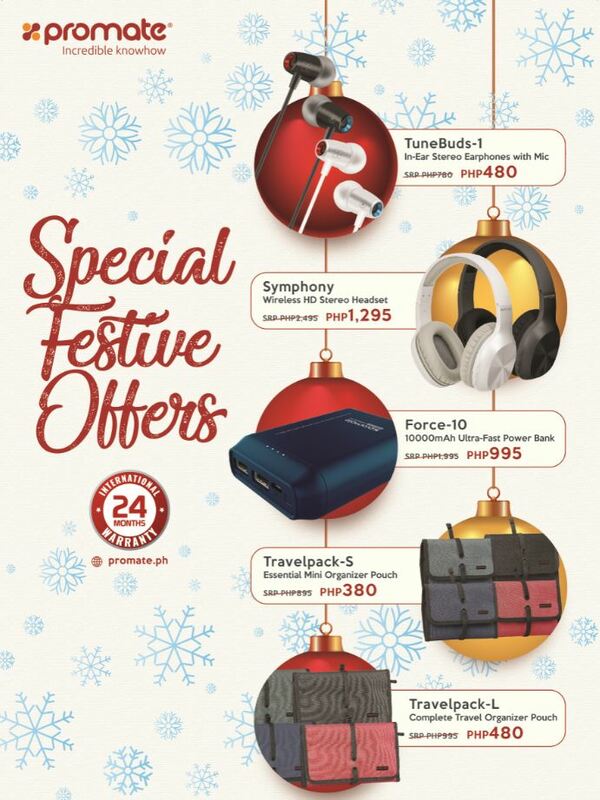 We start of with one of the leading electronic accessory providers, Promate with their special festive offers at select retail outlets nationwide. The TuneBuds-1 In-Ear Stereo Earphones with Mic (discounted from Php780 to Php480) These earphones have an optimally tuned acoustic design that promises a superior listening experience, whether you are on Spotify or watching movies and TV shows on Netflix. They’re light and perfect for the on-the-go lifestyle. Symphony Wireless HD Stereo Headset (discounted from Php2495 to Php1295). (Discounted from Php1995 to Php995) The Force-10 is powerful 10000mAh li-polymer backup battery that is incredibly sleek and lightweight. Travelpack-S Essential Mini Organizer Pouch (discounted from Php895 to Php380) and Travelpack-L Complete Travel Organizer Pouch (discounted from Php995 to Php480). These versatile electronics organizers will keep your travel tech under control in the most stylish and durable way possible. These nylon travel bags come with plenty of room to hold various items like cables, headphones, memory cards, hard drives, adapters, pens and even small electronic devices.